The Twins announced long-term deals with Max Kepler and Jorge Polanco yesterday. Both are somewhat unusual players with whom to sign to a long-term deal, and thus required an unusual deal, which is fantastic, because truth is often found at the edges. Let’s look at how these contracts usually are structured, how Kepler’s is different, and what it says about the Twins and Kepler. Kepler provides some unusual challenges to this structure. The first is procedural: Kepler is a Super-2 player, which means he got arbitration to start a year early. So even though he’s only in his third year, he was going to make $3.125M this year. The bigger issue is that Kepler is not an established young player. He’s made peripheral improvements in his nearly three years in MLB, but his numbers have essentially stayed steady and underwhelming. There’s a lot to like in his profile, and he just turned 26 years old this week, plus he’s relatively new to this baseball thing being from Germany. But the later years of a typical contract provide a significant challenge to the Twins. This year and next year were easy to work out. Even if Kepler doesn’t develop further this year, the Twins would almost surely offer him arbitration for next year, meaning he would get about $6M. His numbers are worth that, and he would be entering his 27-year-old season, which is still on the upswing of a baseball player’s career. But if he didn’t break through, there is a decent chance the Twins would not offer arbitration for the 2021 season. If they did, Kepler’s salary would be raised to $8-9M, he would be turning 28, and he would be a middling hitting corner outfielder, albeit with good defense. He might improve and be worth that money, but maybe not. And if he stays the course again, there is no way they offer him arbitration in his sixth year. That pessimistic career arc shows the challenge the Twins faced in working out a long-term deal. If Kepler doesn't develop, a typical long-term deal would really hurt them in the later years. A fiscally conservative (or if you prefer, “cheap”) team can’t guarantee $10M and $12M paydays to someone who might be a below average outfielder. The available spend every offseason is usually $20M - $60M for a team. Losing $10-12M of that hurts. The Twins lock in a player that is arguably already worth $6-7M to a slew of $6-7M/year contracts. To do so, they pay him an extra $3M this year (remember, he was already going to make $3.25M), guarantee next year (which they almost surely would have done anyway), and then get two years of similar pay without having to worry if he takes a big leap forward. The only really risky year is Kepler’s 7th year, when they pay him $8.5M, so they’re betting on minor breakthrough sometime before he turns 30 years old. The Twins reward? If Kepler does take that giant leap, he’s a bargain, not just for this year and next (which he already was) but for FOUR more years. I’m a Max fan, admittedly, but even objectively that’s a good risk on a 26-year-old with really good plate discipline and power who has a career .730 OPS, even if he’s a career .233 hitter. And for Kepler? He’s guaranteed $35M, even if he never takes the next big step. That's nice. Plus, there’s some upside for him too, if he can look out that far ahead. He’ll be able to hit free agency as a 31-year-old, which is a plenty marketable age. If he’s hitting and if salaries bump up a bit, he could be in line for a deal worth twice as much. 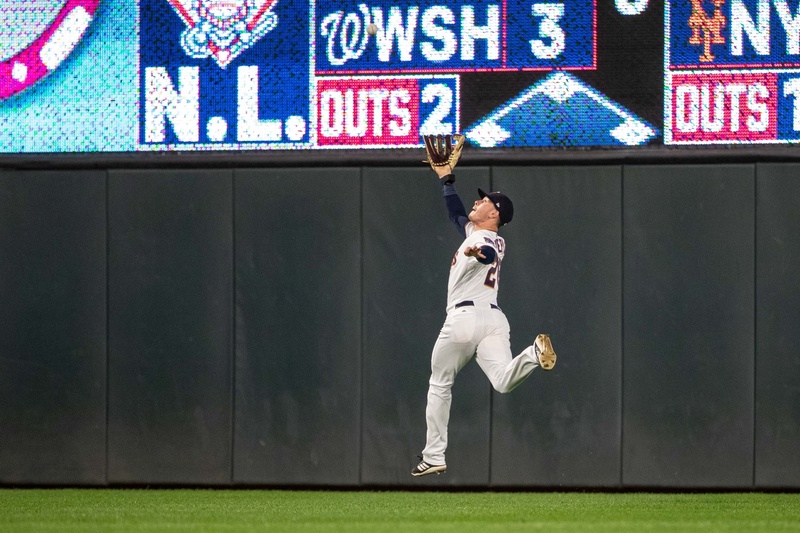 The Twins and Kepler have found a middle ground that balances the risk and reward each needed, despite Kepler not being the prototypical extension candidate. What’s more, it appears the Twins were able to do the same with Jorge Polanco, and tomorrow we’ll examine his contract a little more closely, to see what it tells us about the Twins tendencies. Getting him for $6-7 million over each of the next three years is a steal. Buying out a year of free agency for just $8.5 million is incredible. 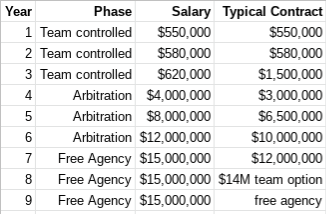 Getting a second year of free agency (only if the team wants to) for $10 million is incredible. I really like the contract. It's as if they agreed to the overall terms and then they moved the dollars around to make it more level. It's really unusual and creative. It's like Denard Span...it might be a bargain contract if Kepler produces and easy to trade for younger talent. Span had defense and speed. Kepler has defense and power. Great article, John. It's weird to see Kepler not bet on himself, but with the way he's stagnated at the plate the past 3 seasons, I suppose it makes sense. But for the Twins, this deal not only becomes a total bargain if he improves, and it makes him easier to trade since they've purchased an inexpensive year of free agency and have a second option on top of that. Now if only we could get Rosario and Berrios to sign extensions like this! Of course, they'll require more money and probably less control of their free agency years. If Kirilloff comes up in 2020, where does he play? I know, I know...it's a good problem to have. Just asking. That is just the thing.FanGraphs disgustingly overrates player value, in my opinion.If you check Brian Dozier as an example he was "according to FanGraphs" worth $40 million and $46 million in 2016 and 2017 (if he were a FA in the open market).How does this jibe with reality? The player valuations based off WAR seems completely arbitrary to me.While WAR is an indicator I like to see it is not infallible and should not be viewed as a singular confirmation of how much a player is worth.What exactly is the logic here?It starts to become far too removed from any kind of common sense and more about numbers.Seems to me in this valuation they assume "average player" has a WAR of 1.0 so that should be in proportion to the average salary.They set that at 7 million and for every WAR point they score you multiply by 7 million?Whatever they do to value Dozier over $40 million in two different seasons says all you need to know about it. I appreciate everything else about FanGraphs, however, this valuation system is utterly absurd.Maddening actually. This is a good idea John, really illustrates the structure. These guys make some thoughtful moves, just a breath of fresh air around here. All these smart details piling up relentlessly have got to put this team in an advantageous situation. There is no way he was worth any of that? 21 million? Come on, what was Yelich worth? 8 trillion? Using whatever formula that is every single player including Bobby Bonilla is underpaid in today's game. It was precisely this kind of thought process that generated the notion last winter that Machado and Harper could be signing $400 million dollar contracts.The kind of thinking that has Machado and Harper both believing they shouldn't take anything less than $300 in guaranteed money. The reality is, you can't assess player value as a dollar figure on a static line like that, because the true value of a player by bWAR or fWAR increases the more WAR they contribute. A 6 WAR player (no matter which formulation you like) is worth more than three time aWAR player, because of the scarcity of a 6 WAR player. It's a real guesstimate to assess dollar value on a linear progression like that and mostly applicable to lower WAR players. I'm a fan of Max, and I hope he has the hitting breakout. There's some data that suggests a change in approach last year that's likely to pay out in future years if he sticks with it. There's also data that suggests he may be who he is as a hitter. We'll see which way it goes. I like Kepler and the contract, especially where the Twins are on the salary cap. A very prudent move, with low risk for the franchise.I don't know much about Fangraph's valuations, but it seems highly unlikely that anyone would pay him $20m as a free agent at this level of performance.If they would, Kepler's agent has done him a disservice. (Unless he is already dealing with a serious injury). Here is discussion on Fangraphs regarding $/WAR. The Fangraphs figure is based on free agency. I think one of challenges that MLB faces is historically the salary structure underpaid young players and overpaid older players. This is changing as teams get better at estimating production declines with age. This is likely one of the reasons Harper is not signed. It is extremely difficult to estimate his value 10 years from now and teams are not willing to take that risk. The flip side of this is that teams will eventually reallocate resources towards more productive (younger) players. Teams have been slow to do so because arbitration disadvantages younger players. (And also paying younger players more puts more pressure on arbitration salaries). Kepler’s salary structure is an example of how paying more for present production can be used to reduce future risk. I would expect to see more of this type of salary structure in MLB going forward. John. Your article was a very informative write up. Thank you. That's the value of a win (1 WAR) on the open market. Kepler is not on the open market, and won't be for some time. Every team is getting "steals" and "incredible" values from pre-FA players by this measure. That said, it's a good contract for the Twins. It adds 1-3 seasons of control at reasonable cost, which not only has the potential of value as a player, but also extends his value as a potential trade asset too. I think that depends on whether Kepler improves his hitting. (Which I think he can and I'm in his corner on that)The "value" here isn't going to be determined by a corner OF who gets most of his WAR from defense....it's the bat that will determine that.2018 Kepler in 4 years, at this price, isn't much of an asset IMO. The flip side, is that his defensive value means any incremental improvements we see on offense will lead to significant value increases. The average major league salary is a shade over 4 million a year.By the rationale (or lack of it) provided through FanGraphs' valuation system Max is worth roughly five times more than the average player if he were to step into the FA market. In reality, I don't think there is a team in the league that would have handed Max the deal the Twins gave him.It isn't an astronomical amount of money, but I cannot envision some other team handing him a 7 year deal.This is comes with him being a known commodity and generally well-liked within the organization.They are betting on Max, and that is a good thing for Max.He knows how to "play the game" and be a good soldier so he gets his deal. As far as FanGraphs money goes, it is like the defunct Italian Lira to me.I had a few friends go to Germany/Italy for several weeks in the fall of 1984.They drank some towns dry in Italy and spend like $10 American dollars in the process.It was too hard to believe, but that was how the currency was valued. That is just the thing. FanGraphs disgustingly overrates player value, in my opinion. If you check Brian Dozier as an example he was "according to FanGraphs" worth $40 million and $46 million in 2016 and 2017 (if he were a FA in the open market). How does this jibe with reality? The player valuations based off WAR seems completely arbitrary to me. While WAR is an indicator I like to see it is not infallible and should not be viewed as a singular confirmation of how much a player is worth. What exactly is the logic here? It starts to become far too removed from any kind of common sense and more about numbers. Seems to me in this valuation they assume "average player" has a WAR of 1.0 so that should be in proportion to the average salary. They set that at 7 million and for every WAR point they score you multiply by 7 million? Whatever they do to value Dozier over $40 million in two different seasons says all you need to know about it. I appreciate everything else about FanGraphs, however, this valuation system is utterly absurd. Maddening actually. FWIW, this isn't really how Fangraphs values players. They have calculated a rough estimate of how much a win (1 WAR) costs on the open market. Yes, they use this figure in a table to illustrate each player's WAR value in dollar terms, but no, they don't really think that Kepler should have gotten $21 mil or Dozier $40 mil or whatever. It's really just saying, a player projected to perform at that level could cost that much on the open market for a single year (a long term deal would involve long term projections/discounts, of course). A right fielder averages about 2 putouts a game.They can go weeks without having an opportunity to make a great play in even then it isn't a guarantee it's a game changer.Defensive value among major league outfielders really is difficult to pin down.A great outfielder doesn't get to do that much more than an average one, whereas a great hitter has so so many more opportunities to shine. It was precisely this kind of thought process that generated the notion last winter that Machado and Harper could be signing $400 million dollar contracts. The kind of thinking that has Machado and Harper both believing they shouldn't take anything less than $300 in guaranteed money. 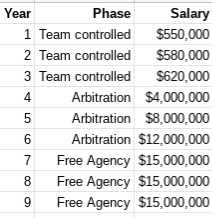 I'd say Harper's and Machado's expdctations are more set by actual contracts like Stanton ($325 mil), Pujols ($250 mil at age 32), and Cano ($240 mil at 31). I could care less about the methodology used to arrive at this absurdity.When they are telling me that Dozier "could be worth" 46,000,000 dollars in the open market for a one year deal I stop listening.It has nothing to do with reality no matter how clever and detailed it might be. The average major league salary is a shade over 4 million a year. By the rationale (or lack of it) provided through FanGraphs' valuation system Max is worth roughly five times more than the average player if he were to step into the FA market. No. The average salary is suppressed by pre-arb and pre-FA salaries. You are comparing apples and oranges when you say "Fangraphs claims FA Kepler would be worth over 5 times the average player!!!!1!1!1!" Look at the average FA projected to produce 2.6 WAR. No, they generally don't get $20 mil for a single year, but they often get a multiyear deal with a discount value based on something close to $20 mil (obviously context dependent on projection confidence, upside, age, other options on the market, etc.). Player salaries resemble to me the way homes were priced in the mid-2000s.The way the stock market was as we moved toward Y2K.The writing has been on the wall for a while. These contracts just don't work and corrections happen. FanGraphs has a valuation model that needs to be adjusted because in no way does it reflect REALITY when it comes to what players get on the open market as free agents. How much longer did player salaries need to increase at ridiculous rates?Average player salariesincreased by over 100% from 2001 to 2015.Was this supposed to continue until the end of time? No. The average salary is suppressed by pre-arb and pre-FA salaries. I think that depends on whether Kepler improves his hitting. (Which I think he can and I'm in his corner on that) The "value" here isn't going to be determined by a corner OF who gets most of his WAR from defense....it's the bat that will determine that. 2018 Kepler in 4 years, at this price, isn't much of an asset IMO. I think 2018 Kepler in 4 years, on a reasonable 1 year contract with two reasonable team option years, could absolutely still be an asset. Nothing elite, of course, but valuable enough to trade for something useful. FWIW, in the story, I don't mention FanGraphs calculation. I haven't really studied it. IMHO, A decent, but not stellar right fielder whose defense (and positional flexibility) also helps, is probably worth $6-7M in the open market. Even if he's nothing more than a guy who mashes the strong side of the platoon, he's worth about that. And if he's not, he's not worth too much less - $4-5M would be the lower end, so at most they're burning a year or two. The non-monetary risk is that he never really develops enough to help a contending team. But if that happens, I still think its a tradeable contract to a team that is looking to fill a spot. Would he have gotten that contract from any other team if he was on the free agent market? Undoubtedly. Would he have agreed to it? I bet not. I understand that so need to explain. Then you understand your comparison was apples and oranges? FWIW, he would likely be on the sideline with Manny and Bryce waiting to get his money.Seven years for Max Kepler after last year?The Twins clearly like him and trust him.I can't see him getting that kind of security from an organization that didn't raise him. This contract is unique.We could benefit enormously from it, but I cannot agree with anyone who says he'd get 7 years in the open market.Not until these kinds of contracts for 25 year old guys who hit .224 the season prior become the norm.